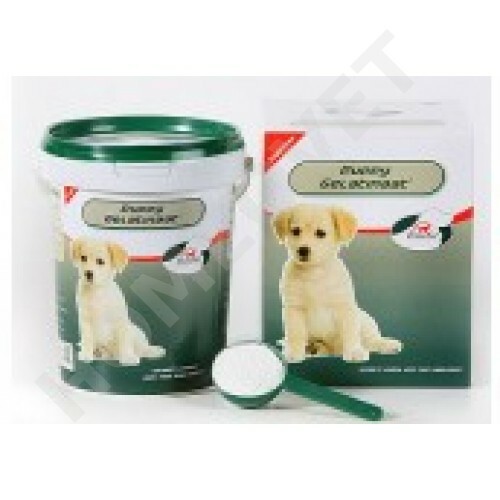 PrimeVal Puppy Gelatinaat - for development of healthy bones, cartilage, ligaments and tendons. PrimeVal Puppy Gelatinaat has been developed from the successful product PrimeVal arthritis Gelatinaat for adult dogs. It has a special formulation to which no calcium is added. An excessive intake of calcium is an important risk factor in the development of osteochondrosis, and hip and elbow dysplasia. Young, growing dogs are not yet capable of properly regulating calcium uptake in the gut, so that an undesirable excess can be taken up in the body. PrimeVal Puppy Gelatinaat consists of 100% pure collagen hydrolysate, which contains a wide range of amino acids. Amino acids bond together in chains, of which there are thousands of possible combinations. The particular amino acid chains in PrimeVal Puppy Gelatinaat match those in the pup’s joint cartilage, and are main constituents of the pup’s joint capsules, ligaments, skin and coat. The specific formulation of PrimeVal Puppy Gelatinaat significantly reduces the chance of developing skeletal and joint disorders. for the development of a shiny and flowing coat. Instructions: PrimeVal Puppy Gelatinaat can easily be added to you puppy’s daily food. Suitable from 8 weeks. The amount depends on your dog’s weight. This feed stuff contains restricted animal material. Do not feed to cattle, sheep, goats, deer or any other ruminant animal. Keep out of reach of children.